Lemon verbena tea is getting more and more popular nowadays, though it is very often thought to be something like one of the oldest folk remedies of our grandma’s. Lemon verbena tea is an infusion of green leaves of verbena plant (Aloysia Tryphilla), a medicinal herb originating from Argentina, Brazil, Peru, and other regions of South America, though nowadays it is cultivated almost all around the world. Verbena also plays a role as a culinary spice which is quite commonly used in French, Spanish, Italian cuisines, along with culinary tradition of other countries of the Mediterranean and South American nations. Verbena is widely used for preparing salads, stuffed dishes, grains, desserts and beverages since it has very strong characteristic aroma and flavor of citrus fruits. Lemon verbena tea or herbal infusion is very easy to be prepared, and it allows us enjoy numerous benefits of this amazing medicinal herb. For your lemon verbena tea, you can use both fresh or dried leaves since you’ll get prefect aroma in both cases. If you have dried leaves, use 1-2 teaspoons for 1 cup of boiling water, and if you have fresh leaves – 0.5 tablespoon will be enough. Steep for 5 minutes, and add a little honey to enhance the taste of the tea (if you like). Drinking a glass of freshly prepared lemon verbena tea after having meal is a perfect natural solution for those who suffer from minor digestive disorders, especially indigestion, heaviness in the stomach, constipation, flatulence, and others. Digestive properties of lemon verbena are among the most known benefits of this medicinal herb, and they were proven by numerous researches including the one of the expert group by German researcher Joerg Gruenwald, published in 2009 in the journal Clinics in Dermatology. Lemon verbena is also known for its being a great tonic for nervous system. It is also recommended to those who suffer from various mood disorders including seasonal depression, anxiety, sadness, apathy, etc. Lemon verbena tea can assist in relieving fatigue and the symptoms of restlessness, aid in combating sleep disorders, help in achieving spiritual balance and learning to enjoy this life. Antispasmodic benefits of lemon verbena tea can be used to prevent and treat stomach spasms, muscle spasms and colon spasms, relieve colic and whooping coughs. Traditionally, in South America this herbal tea has been used for reducing fever and other symptoms of respiratory system infections. In addition, very powerful anti-bacterial benefits of lemon verbena tea make this natural remedy useful when fighting against bacterial infections, both internal and external. Very often, lemon verbena is mixed with other common medicinal herbs for boosting the effects of herbal tea. 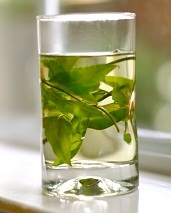 For example, by adding some mint to your lemon verbena tea you can enjoy more antioxidant and digestive effects, by adding some liquorice it is possible to increase endocrine system and liver protection properties, and by adding some valerian root it is possible to strengthen anti-depressant properties of this natural remedy. Finally, one of the most common uses of lemon verbena tea is preventing and treating various common skin condition, including swelling, irritation, itching, skin puffiness, etc. The best way to apply this herbal infusion for skin health is massing problematic zones with this infusion or verbena essential oil, which also helps stimulate blood circulation, nourish skin cells and speed up healing processes. Talk to your health care specialist before starting any kind of treatment involving lemon verbena. If you want to try lemon verbena tea and enjoy its amazing warming taste, check out this article for a piece of useful information. I was doing some research about Lemon Verbena and found that Bigelow Teas — that commercial tea manufacturer — uses Lemon Verbena in many of their flavors. The quality may be debatable, though. But it does represent a good starting point.